JoBeth Allison displays the quilt she made to support the Disaster Relief Fund. At left is Director of Health and Safety Services Mark Garrett. 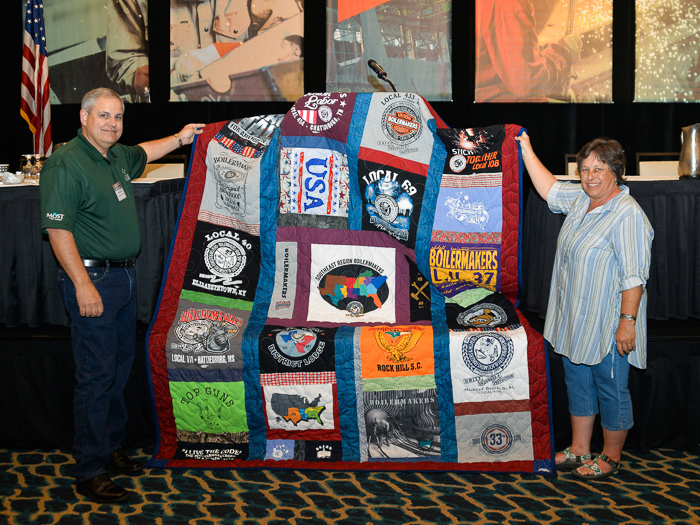 JOBETH ALLISON, wife of Local 69 (Little Rock, Arkansas) BM-ST Rodney Allison, used her quilt-making skills for an especially good cause – raising money for the Boilermakers’ Disaster Relief Fund. To create the quilt, she contacted construction lodges throughout the Southeast Section and requested T-shirts specific to each lodge. Then she worked the T’s into the quilt design. She also used T-shirts from MOST and the Southeast Joint Apprenticeship Committee. The unique quilt was raffled off at the 2017 Southeast Area Tripartite Alliance conference in April and brought in a total of $4,240. Retired Special Assistant to the International President and Boilermaker Code trainer Steve Speed won the drawing. JoBeth also created a smaller version of the quilt, which she presented to IVP-SE Warren Fairley at the conference in appreciation of his leadership. The disaster relief fund provides monetary assistance to members and their families impacted by floods, fires, tornadoes and other catastrophic events in the United States and Canada.